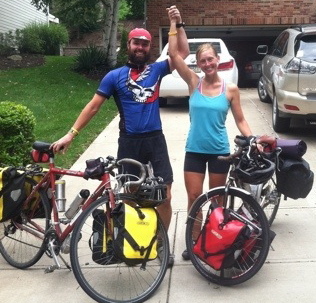 CP’s Honeymoon Heroes: Biking Across the US, for Patagonia! We may be leaving our northwest mountains behind for this trip, but our appreciation for the preservation of national parks and open space runs deep. We have spent countless days and nights hiking, camping, snowshoeing, skiing, and storytelling in PNW parks and are excited to explore other national parks along our journey. Continued preservation of existing park land is important, but so is the creation of more protected space. An organization working in South America, called Conservacion Patagonica, is doing just that–buying up land that has historically been stripped for cattle and sheep production and converting it back to its natural state to be donated back to the government as protected National Park land. Erin and Dave finished their trip last week. As they put it, they “pedaled through 11 states, 3 time zones, from sea level up to 11,312 feet in elevation and everywhere in between, ate [their] way through 6 jars of peanut butter and too many bananas to count, patched and pumped 7 flat tubes and 2 worn tires, and sweated endless liters of life and love.” We spoke to them this morning about their experience, reflections on national parks, and connection to CP. Q. Sounds like an incredible trip. Can you describe your route for us? A. We started off taking the train south from Seattle, where we live, to San Francisco. 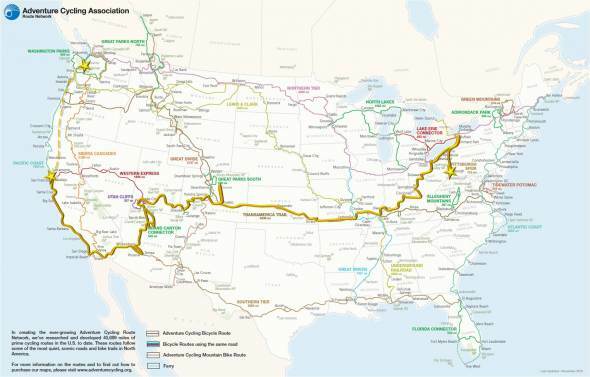 From there, we biked down the coast to San Diego, followed the border for a bit, cut north in Arizona toward the Grand Canyon, meandered around Colorado for some time, and headed east through Kansas and Missouri. Then in Kentucky we turned more north, following the Ohio River for a ways. We biked along the shores of Lake Erie before heading south to Pittsburgh. We weren’t trying to take the most direct route. 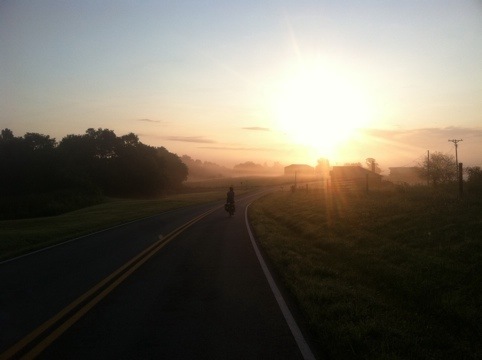 Some cross-country cyclists just want to race from one coast to the other. We thought about our trip more going from “home to home,” a true tour of the backroads and small places of this country. Q. Did you visit many national parks along the way? Which were highlights? A. We probably visited around 30 national or state parks along the way–we tried to camp as much as possible. At all the parks in California, there’s a great hiker/ biker provision that states that anyone arriving by foot or bike cannot be turned away. So even when we arrived late to a campground that been booked for car campers for month, we could stay in a special area for bike campers. That made visiting parks in California particularly easy, and the California coastline is spectacular. Zion National Park might have been our favorite park, or the Grand Canyon, where we spent some time backpacking. Q. 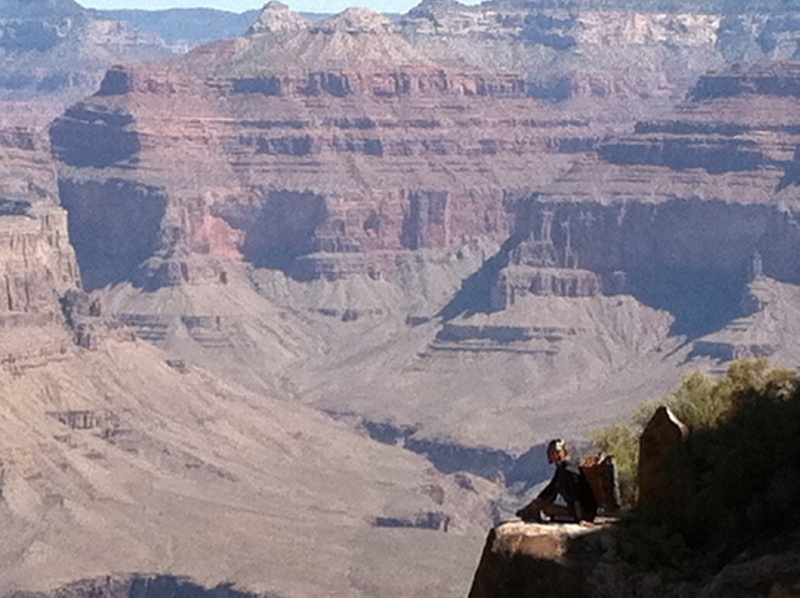 After your trip, do you have any thoughts on what makes a park great? A. When you’re traveling by bike, you really notice the transportation issues at national parks. We saw plenty of traffic and overcrowding that made us happy to travel by bike. But we also saw examples of successful management systems: road closures, shuttle buses, regulations to encourage bikers, and more. Most rangers were so helpful and accommodating, which made a huge difference. Accommodating alternative forms of travel is important now, and will continue to become more important. We met many other cyclists on our trip, from all over the world, of all ages. The California hiker/ biker provision definitely encourages people to access parks without getting in their cars, which seems like a great policy. Q. How did you get time off from work to do this trip? A. Both of our managers were very supportive of this trip, and excited we were taking on this challenge. Dave works at an organic farm called Full Circle that runs a farm-to-table program, and Erin is a research scientist at the University of Washington. Q. What connections do you see between your trip and Conservacion Patagonica’s work? A. We see a big parallel between low-impact travel and conservation. We spent four months living on our bikes, with very few possessions–just what we could carry in our saddlebags. And we lived very comfortably, and happily, which reinforced to us the importance of striving to live simply and more thoughtfully. Conserving land fits into this ethos as well. Moreover, national parks are places where people experience how delightful living simply and less materialistically can be. Q. How do you plan to stay involved with CP in the future? A. We’d love to come down and volunteer, maybe even arriving by bike! This is totally amazing and inspiring to read about. Keep up the superior work over in Patagonia and a big thanks to Dave and Erin for showing that simple travel is still beautiful as it always was.